Soon after you discover that you are pregnant you are advised to either see you midwife or your GP to organize your antenatal care. Antenatal care is the care that you receive from health care professionals such as midwives, GP’s, and obstetricians during your pregnancy. You will be given useful information about being pregnant and this information will enable you to make informed choices about your pregnancy. You will also be given useful written information as well. This will include information about antenatal classes and infant feeding workshops. At your first appointment the GP or midwife will help you to decide which unit you wish to book for your maternity care. (If you are considering a home birth then you will need to book your care with your geographical local unit). Once you have decided which unit you wish to be booked with, the GP or midwife inform you how to organize the booking appointment. This booking appointment will be at around 8-10 weeks of pregnancy and is usually carried out by the community midwife. This appointment will last for about 1 hour and usually takes place in the local health centre; the midwife will discuss antenatal screening tests and scans, and can refer you to an obstetrician if appropriate. If the information gleaned at this meeting suggests that your pregnancy is ‘low risk’ of complications then you will be cared for by a team of community midwives that cover your local area. If you wish you can share this care with your GP. You will be given your handheld maternity record at this appointment. If you are low risk and expecting your first child you will have up to 10 antenatal appointments. If you are low risk and have had a baby before you will have up to 7 antenatal appointments. You will also sent your appointment for your first scan appointment between 12-13 weeks of pregnancy. This may be carried out at either St Peter’s Hospital ‘Abbey Wing’ or Ashford Hospital ‘Topaz Suite’. Under certain circumstances you may require more antenatal appointments. These women will be offered a consultation with an obstetrician. Obstetricians are registered medical doctors who specialise in pregnancies and births which have become complicated. If the medical condition is not likely to affect the pregnancy the obstetrician may suggest that the midwife provides most of the pregnancy. Midwives work along side obstetricians to provide supportive care for women whose pregnancies and/or births have become complicated. Even where pregnancies are complicated most care will be on an ‘outpatient basis’ with as few stays in hospital as possible. When pregnancies are not so straightforward, your timetable of pregnancy care will be agreed between yourself and the Consultant Obstetrician planning your care. When complications arise they do not always cause problems for the baby or for yourself but they do need the specialist input of an obstetrician; your midwife will arrange a referral for you as necessary. 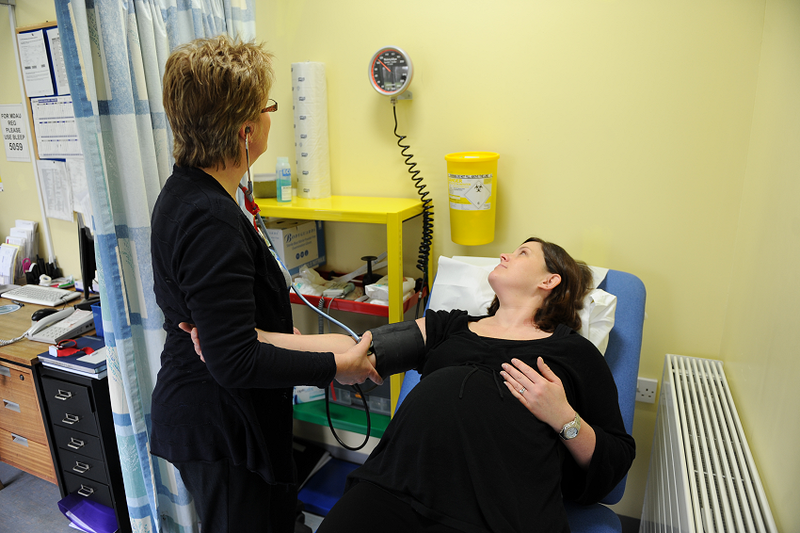 At each antenatal appointment the midwife or GP will check your blood pressure and test your urine and on certain occasions they may record your height and weight. They feel your abdomen to your baby’s growth and position. From 21 weeks onwards they may listen to the baby’s heart beat if you want them to.